This download includes 20 daily decimal sheets. 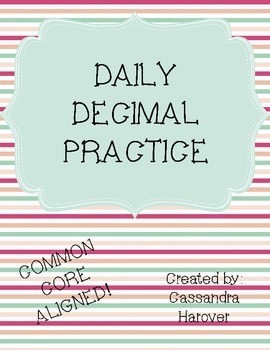 These Daily Decimal practices are a wonderful tool to use for a review or a bellringer with your students. 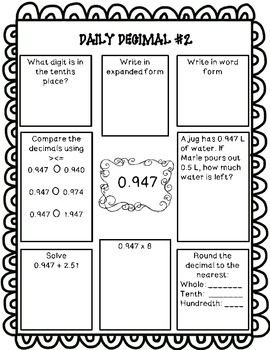 Each sheet has a different decimal (tenths, hundredths, or thousandths), and on each sheet students are asked to identify place value, write in expanded and word form, compare, round, solve two different problems that could be any of the four operations, and solve a word problem. These are a great quick assessment tool to see which Common Core concept your class needs more assistance with. I use these with my 5th graders and it’s been an amazing review tool towards the end of the year.